Julian Assange remains holed up in the Ecuadorian embassy in London with ailing health and plenty of time on his hands. So much time, in fact, that he's decided to... crowd-fund a life-size statue of himself, presumably so people don't forget what he looks like? 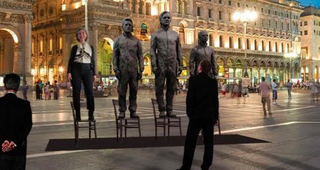 The Independent reports that Assange is attempting to drum up funding for a full-size bronze public artwork which will feature himself, Chelsea Manning and Edward Snowden. He refers to it as a "a monument to courage." The statue, which will be made by Italian sculptor Davide Dormino, will be called Anything to Say?